Why is BMW working on an all-wheel-drive M5? A BMW M5 with xDrive? Don your Internet fire suits and get to the forums in in 3-2-1... There's no production confirmation, but as Autocar reports, BMW officials have confirmed they're messing with the concept. Is the end of tail-out action near? 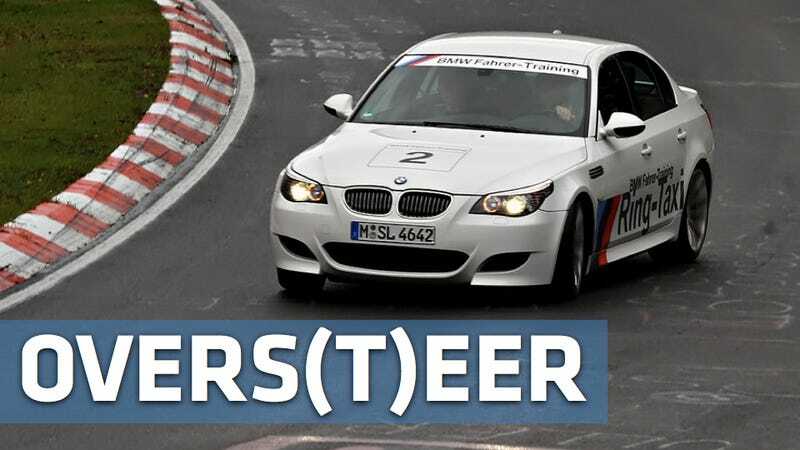 It's not exactly a new discussion thread; talk of an all-wheel M5 has been lighting up the forums since the early naughts, with most fast-5 fans more excited about their dental work than the prospect of an xDriven M5. Still, the company's already developed the gear to the extent that it's likely ready for an M vehicle that doesn't trigger airliners' collision avoidance systems. That's how high they are. Ah, never mind. The short answer to the headline question is naturally, "because they can." The longer answer has a bit to do with the company knowing its audience, which only slightly comprises people concerned with hanging the tail out over three lanes of interstate, as drivers of crossovers look on in horror and their children cheer. The issue is about controlling the experience. Considering how much power the M5 puts down, and plotting that against weather and driver acuity, a proper all-wheel drive system like BMW's xDrive is undoubtedly the safest choice, and as much as we loves us some hoonage, roadway safety is important — especially to the target buyer. But what about theater? Isn't automotive enthusiasm indelibly linked with tail-out theatrics? Think back to every one of your favorite movie chase scenes. Name one that featured cars going really fast, but safely. Can't do it, because precision and safety are boring, and bored people don't buy boring things whose capabilities aren't immediately apparent. There's a great story about famed test pilot Tex Johnson's first demo of the Boeing 707 in front of airline executives during the 1950s. Tex took the prototype passenger jet up above Lake Washington, did a 1G barrel roll and brought the plane down safely. Later, Boeing president William M. Allen asked him just what the hell he thought he was doing. Without missing a beat Johnson shot back, "I was selling airplanes." Is it better to build a car that, in the right hands, can make theatrical moves even if the car's owner wouldn't dream of it? Or build one that any driver can slice through time and space more swiftly and accurately than a TERCOM-guided missile, but couldn't get its tail out if King Kong finger-flicked it in the quarter-panel? Sure, racing is precise because races are won in the hundredths column, but would Top Gear be what it is today if Clarkson and Hammond and May always kept the tires in a line? Automotive enthusiasm comes from lots of angles, many between 30 degrees and 60 degrees. Here's hoping BMW remembers something it did a few years ago, if it ever decides to make its 500-hp cars all-wheel-drive permanently.